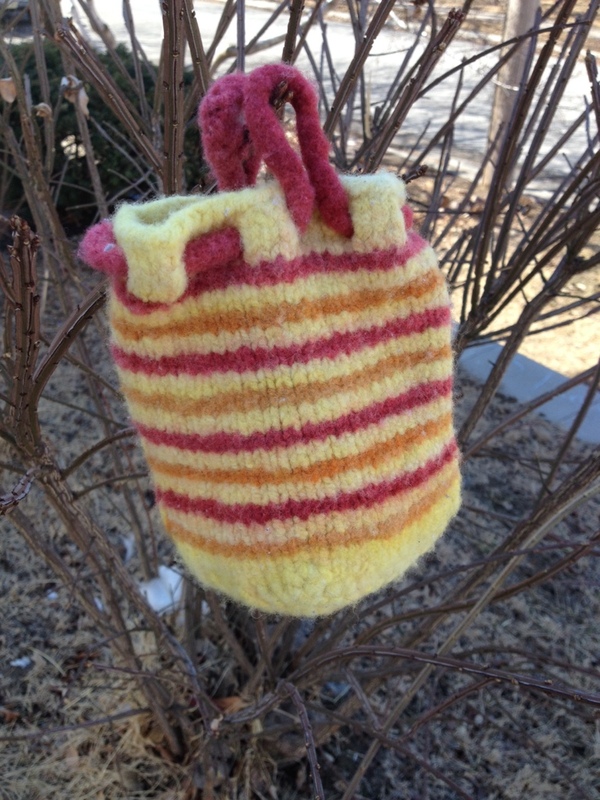 I love these little felted spinning bags, and I thought, what better gift for a spinning friend who doesn’t knit? So, I whipped one up for my friend Marja a few weeks ago. I used yarn that I dyed with koolaid and spin years ago, early early spinning for me. It was sitting in my stash, and I thought this would be a really fun way to use it. I modified the bag a bit, instead of one loop, it has an icord drawstring. this way she can configure it however she likes on her wheel. And one of my gripes about my bag is that it gaps, this one isn’t likely to gap. For added fun, I stuffed it full of goodies. An orifice hook, a small pair of scissors, a bunch of leftover yarn for leaders, a wpi gauge, and some sample size soak washes. Everything she could need in it really, and all things as a new spinner she might not know she needs. I have always enjoyed having my tools at my fingertips, and this was a fun way to get her set up as well. Plus, the bag is bright and springy, and I think we ALL need that right now.